Journalist Tatiana Morina arrived in Kamchatka in summer 2016 as part of a project to help out at the Bystrinsky Nature Park. She spent three months in the great outdoors working as a volunteer to create a map of routes for future park visitors. Bystrinsky Park is the largest and the least visited sanctuary in Kamchatka. It is best known for its reindeer breeders, who live and work in the tundra of central Kamchatka. There are no erupting volcanoes, geysers or huge spawning streams here, but local landscapes are unrivaled by any other in Russia or the world. Our work started in Esso, the administrative center of the district. Our first task was to find a path to Lake Blyudtse ("Saucer"), which is located on one of the Kozyrevsky Range peaks. We spent five days climbing the ridges enduring stormy winds, making our way through impassible thickets of Siberian dwarf pines, descending from cliffs and following bear trails, which lead to inevitable encounters with some of Kamchatka’s most famous residents. Like other Kamchatka's ranges, the Kozyrevsky Mountains were literally pushed out of the ground by volcanic activity. With altitudes of 1,500-2,000 meters above sea level, they are relatively low, but the surrounding landscapes are much lower. As you stand on the ridge, it seems like you can see all of Kamchatka from east to west: Klyuchevskaya Sopka and the adjacent volcanoes on the Pacific coast, the Sredinny Range close to the Sea of Okhotsk and the Anaun volcano, which is the geographical center of the peninsula. After the hike to Lake Blyudtse, our group headed to the southwestern cordon of the park. There, after two months of constant hiking, we spent a day or two at the base camp before setting off on the road again. We trailed a ring route around the Ichinsky volcano by crossing the Zapadny ("western") glacier, marked a path to Lake Ketachan and discovered a new tourist attraction – a tiny turquoise lake within an ancient lava stream. Our only means of communication was a tracker, our menu was limited to grains and canned meat, our sole reference was old Soviet military maps and our only protection against bears was soccer vuvuzelas and a single flare pistol. The Ketachan Cordon is located 120 kilometers away from the nearest settlement and only 16 kilometers from the gold works on the Aga River. It is a land of marshes, huge plants and highland tundra with plenty of berries and mushrooms in the summer. 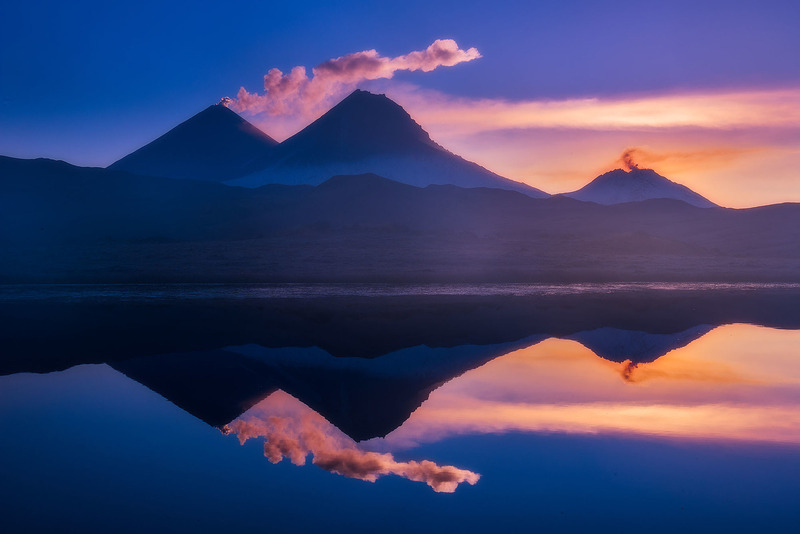 One of the brightest impressions was an ascent to an isolated lake at the foot of the dormant Ichinsky volcano; from the lake we climbed its neighbor, the Severny Cherpuk volcano. The edge of its caldera overlooks the red-and-green waterless tundra, which was smoothed out by a powerful lava flow 300 years ago. During one of the trips, we discovered a stream blocked by glossy black obsidian. Another trip was memorable for chasing salmon with our hands and cooking a spontaneous feast. During the third trip we almost lost a few people crossing a whitewater river and barely managed to scare away an overly curious bear from our camp. During the last trip, we came across a group of reindeer breeders and enjoyed a cup of tea and a fascinating conversation with a chum keeper who feeds and houses her family in the highland tundra. She lives with three grown-up male herders and six grandchildren – the youngest has never descended from the mountains to meet other people. After Lake Ketachan, we were sent to the base camp of the Klyuchevskaya Park to help the administration with tourist accommodations. Good weather is rare here, so most tourists leave after seeing a fragment of the caldera of Plosky Tolbachik – which erupted three years ago – and walking through the fog along a path made on a fresh lava field. We were lucky: We had enough time to wait for a fine day, so we climbed to the top, making detours to see the fumaroles, lava caves and hot lava vents, took a close look at the eruption of the Klyuchevskaya Sopka and returned to the base across cinder fields. It was not until then that we realized that detailed maps and freedom of travel are the highlights of being a volunteer in Kamchatka. Shortly before our departure the park administration gave me some time off and together with my traveling companion, a Belorussian zoologist, we hitchhiked to Ust-Kamchatsk – another destination largely disregarded by tourists. The settlement is located near one of Kamchatka's most active volcanoes, Shiveluch, which regularly sprays tons of ash in its vicinity. Our route followed the ocean’s coast to Kamchatsky Cape, where the Pacific Ocean meets the Bering Sea. Three days in a hunter's cabin on the ocean’s shore surrounded by ring seals, sea lions, hundreds of snow crabs and incessant bears was certainly an impressive finale to my Kamchatka journey.